Seismic Test for scale-model of building and component to examine earthquake resistance can be performed by this large-sized shake table. Earthquake waveforms, whichever recorded or pseudo, can be reproduced on this table. Multi-axis test system applies a wide range of vibration test for the studies of transportation and the vibration resistance of applications. 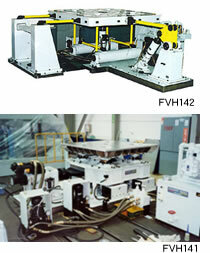 This bi-axial shake table applies for vibration tests to units for transportation and quake proof. The patented unique mechanism, which reduces number of the actuators produces a good cost performance for bi-axial shake tests.